A baghouse is a dust collection devices that filter air by passing it through a cloth or synthetic fiber media (or bag). A bag is a long cylinder-shaped envelope that collects dust on its exposed surface. Baghouses differ not by the method by which dust is removed from the airstream but rather by the method by which dust is removed from the bag. If used in conjunction with a cyclone, a baghouse is used as an after filter and located downstream. Baghouses are necessary for air filtration, not scrap collection. Unlike the cyclone, the fine paper dust collected from a baghouse has no value in recycling. Baghouses are necessary where moderate to stringent emission control measures are in place. In addition to its environmental value, a baghouse may reduce winter heat loss if conditioned air is passed through the baghouse and recirculated back into the facility. Unlike a cyclone, a baghouse can support the cleaning efficiency necessary to direct its outlet air back into the plant. Given an air capacity, a baghouse often may be selected based on a set air-to-cloth ratio. The air-to-cloth is not actually a dimensionless “ratio”. In the U.S. system of units it equals the average filtration velocity (feet per minute or fpm) which is the system capacity (cubic feet per minute or cfm) divided by the cloth area (square feet). Although air-to-cloth ratio standards differ from user to user, their usual range is from 5:1 to 10:1, with 8:1 as the most common. Although the air-to-cloth ratio is an essential design parameter, it is not more important that a manageable interstitial velocity. The interstitial velocity is the velocity of the unfiltered air traveling upward in between the bags. This velocity is greatest near the base of the bags, before any air is absorbed through the media. The maximum interstitial velocity can be calculated by dividing the cfm filter capacity by the horizontal cross sectional area of the unit, counting only the area outside of the bags. If this value is too large (over 400 fpm), it will prevent dust from falling below the elevation of the baghouse air inlet. The dust particles that have been blown (or pulsed) away from the dust layer on the bags will become entrained in the upward moving airstream and forced back toward the surface of the bags. Fine paper dust is especially susceptible to this, even at low interstitial velocities (over 200 fpm). Baghouses are identified by their method of self-cleaning. A reverse-air baghouse blows air backwards through the bags from the clean-air (plenum) section of the unit. This unit requires a three-phase electrical supply to operate its reverse air blower and the blower outlet turning arm mechanism. By contrast, a compressed-air (or pulse-jet) baghouse requires not only a single phase 120 VAC supply for the electrical sequence timer operation but also a supply of clean, dry compressed air (usually 90-100 psig). This timer controls the operation of a series of solenoid valves that regulate the access of compressed air to the baghouse. A quick pulse of compressed air sends a rippling shock wave traveling down the length of the bag. A third type of baghouse is the shaker. This involves a framework of cam mechanisms, seated in the top of the unit. The shaking action may be either manual or motor operated. Determining the type of baghouse from its trade name may prove difficult since not all manufactures share exactly the same terminology. Furthermore, some baghouses may use a combination of two cleaning methods. Some end-users will prefer only one type of baghouse; others may have preferences governed only by economics. The purpose of all of the above self-cleaning methods is to loosen excessive dust from the outside of the bags. The dust particles are then free to fall toward the bottom of the baghouse into a hopper or drum. 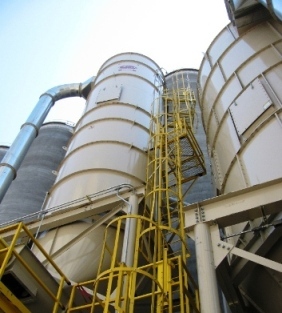 Dust buildup in a hopper can be removed by either a rotary valve (airlock) or a screw conveyor. The average filtration velocity (or air-to-cloth ratio) is no greater than 5 fpm. Some filtering applications are designed to fall within the above guidelines. However, because of either spacial or economic constraints, a baghouse large enough to hold the filtration velocity below 5 fpm may not be available. As a result, a majority of actual filtration velocities climb into the 8 to 9 fpm range. According to some bag manufactures, operating the baghouse in this range will diminish the efficiency slightly, but not below 99.7%. Other factors may further hinder bag efficiency, such as torn bags resulting from improper bag installation as well as poorly designed or partially blocked baghouse air inlets. Assuming that the incoming dust concentration does not exceed 10 grains/cu.ft., a 99.7% efficient filter would allow no more that (10)(1-0.997) or 0.03 grains/cu.ft. of dust concentration in the outlet stream. A 99.9% efficient filter would allow no more that (10)(1-0.999) or 0.01 grains/cu.ft. through the outlet. The concentration and median particle size of dust generated by the product that becomes trapped in the incoming air stream depends on many factors. Some of these factors include the type and density of the product, the method of conveying the product, the moisture content of the product, and the amount of entrained air in the product. This dust concentration may vary from as little as 2 grains/cu.ft. in metalworking facilities to more than 15 grains/cu.ft. in some woodworking operations. There is no substitute for actual on-site testing if this number is critical to obtaining an air permit. Without knowing the incoming air dust concentration, the outlet dust concentration cannot be approximated with any reliable accuracy. A pressure relief panel is a quick-release vent designed to direct the force of an internal baghouse deflagration (or explosion) in an open area in order to minimize damage to the baghouse and adjacent system ductwork. Pressure relief panels are used less frequently on cyclones. In NFPA (National Fire Protection Association) Publication 68 (Section 4-3), the required vent area is treated as a function of the strength of the containment vessel (i.e., the baghouse or cyclone) instead of the total air volume inside the dust collector. 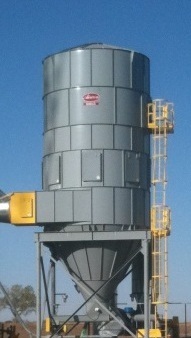 An old standard held by most insurance companies still determines vent area based on this inside dust collector column (according to a maximum allowable vent “ratio”). The current trend seems to be moving away from the vent ratio method as many insurance companies begin the process of updating their standards to better harmonize with the NFPA method. Companies that still rely on the maximum allowable went ratio method often set them between 40 and 70 cu.ft./sq.ft. Setting this ratio too low may actually have a harmful effect on the dust collecting vessel that the vents were designed to protect. This problem occurs because the maximum thickness of any explosion vent panels are required by NFPA Publication (Section 4-6.2) to be no heavier than 16 gauge (or 2.5 lbs/sq.ft. ), which is less than half of the weight of the standard material used to make the body of the baghouse. Thus, anytime a vent is added to the body of a baghouse, a piece of either 7 or 10 gauge metal is replaced with a lighter 16-gauge metal. Obviously, there is a limited number of pressure relief vents that the body section of a baghouse can withstand if the structural integrity of the entire vessel is to be preserved. The pressure differential (or pressure drop) across the bags is most easily measured by taking the pressure difference across the tube sheet. This is possible because all of the air inside the bags is at the same pressure as the air in the clean-air plenum above the tube sheet. A newly installed baghouse will initially show a pressure drop of only 0.5 to 1.5-inch water column. This pressure differential will slowly and steadily increase to level at about 3-inch water column after one to two months. A properly functioning self-cleaning baghouse will not allow this pressure differential to continue to increase much beyond this point. Usually the baghouse pressure drop will range from a minimum of 3-inch to a maximum of 5-inch, averaging 4-inch water column. A pressure drop of over five usually indicates that the bag are blinded. This occurs when dust particles have so thoroughly saturated every microscopic void between the bag fibers that airflow is noticeably restricted. This is most often caused by a high air-to-cloth ratio (or filtration velocity). Baghouse pressure differentials are not necessarily a direct indication of filter efficiency. The building up of a dust cake on the exterior surface of the bags may actually increase efficiency, but too thick of a layer will diminish the ability of the bags to handle their designed quantity of air. Most fabric dust collectors in the paper industry are equipped with either 12 ounce or 16 ounce, singed polyester, non-woven (felt) bags. The weight of the filter media (12 ounce versus 16 ounce) is based upon one square yard of clean fabric. The slightly heavier 16 ounce media is preferred by customers who launder their bags often. Although a 16 ounce media is more durable that a 12 ounce media, it is not necessarily more efficient. Singed polyester is good for all grain, paper, woodworking and most medium-temperature non-toxic duct environments. For heavily acidic or alkali dusts, PTFE (Teflon®) or polypropylene bags should be considered. An upper temperature limit for singed polyester media is 275 degrees F for continuous operation and 300 degrees F surge (for only brief periods of use). Although they are used to a much lesser extent that singed polyester, a paper-pleated bag has an advantage over a conventional flat-surfaced polyester bag since it and squeeze more filter media area in the same volume. However, price works to its disadvantage. A paper-pleated bag may cost more than 10 times that of a polyester bag of the same diameter and length, while providing only four to five times the filtering area. Depending on whether a baghouse operates under a continuous or intermediate duty cycle, the average life expectancy of a 12 ounce or 16 ounce singed polyester bag ranges from four to eight years. While some companies may to elect to replace bags every year or every other year, a bag typically should not show any noticeable decline in efficiency until after at least three years. Improper laundering, high-filtration velocities (over 12 fpm), high temperatures (over 120 degrees F), continuous saturation under high humidity, or a combination of these adverse factors may abbreviate bag life. On the other hand, bags that show little or no wear after ten years should indicate to the user that perhaps the baghouse was initially oversized for the system; therefore, neither the bag nor the baghouse was ever used to develop its fullest potential. Permeability is the measure of the amount of air that will flow through a square foot of test fabric when a 0.5-inch water column pressure differential is maintained across the fabric. Clean, brand new 16 ounce singed polyester bags usually begin their life of service with a permeability of between 25 and 30 cfm. After about a year the permeability of an average bag will plummet to between 3 and 6 cfm. A bag is considered “blinded” when the permeability fall to or below 1.0 cfm. Designers, Manufacturers, and Installers of Dust Collection Systems, Pnuematic Conveying Systems, and Industrial Air Handing Equipment.